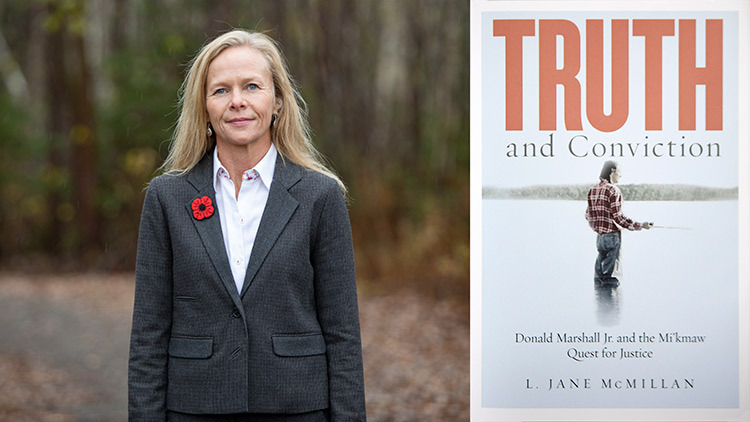 StFX anthropology professor Dr. L. Jane McMillan has celebrated significant accomplishments over the past few weeks: she was an invited speaker at Harvard University, travelled to Toronto to accept an award, and her new book, Truth and Conviction: Donald Marshall Jr. and the Mi’kmaw Quest for Justice, has just been released—to much praise. The book is an account of how one man’s fight against racism and injustice transformed the criminal justice system and galvanized the Mi’kmaw nation’s struggle for self-determination, changing the landscape of Indigenous rights in Canada and around the world. “Jane McMillan has written an admirable, engaging, and formidable book about an Indigenous man’s quest for justice against the systemic injustices of Canada,” writes Sákéj Henderson, Research Fellow, Native Law Centre of Canada, at the University of Saskatchewan. It’s praise echoed by John Borrows, Canada Research Chair in Indigenous Law, at the University of Victoria. “This book offers powerful, insightful, and intimate insights into Mi’kmaw law and lifeways. It contains a perfect mix of stories, context, history, and analysis. It is just what I need to understand and be able to teach law in more nuanced ways,” he writes. The book’s publisher, UBC Press, has selected Truth and Conviction as a lead title, an honour in that it means they believe the story will resonate beyond the academy. “I’m excited. I hope it’s helpful. I hope there’s messages in the text that will be useful and will provide some guidance in how to engage in relationships that are reconciliatory and will help advance Indigenous rights,” says Dr. McMillan, the former Canada Research Chair for Indigenous People and Sustainable Communities (2006-16) at StFX and the current chair of the StFX Anthropology Department. She is a cultural and legal anthropologist specializing in Indigenous justice and applied research methodologies. She has worked in collaboration with Mi’kmaw communities through Atlantic Canada for 20 years, advocating for what they would like to see for legal reforms. “It’s surprisingly an emotional experience,” she says on receiving the book. “It had been a long and sometimes difficult journey. “It chronicles the wrongful conviction of Donald Marshall Jr. and the Supreme Court of Canada fishing decision R. v. Marshall. It assesses the shifting legal landscape of the Mi’kmaw nation and investigates the state of justice for Indigenous peoples in Canada. It is in part a personal account. I was Donald’s partner for 13 years. It’s really about honouring the impacts of his life and legacy,” she says, noting how his life was a catalyst for legal reform in the Canadian justice system and for the reinvigoration of Mi’kmaw legal principles. The book is also about treaty rights and treaty education. She says it is important to document, teach and learn from Indigenous ways of knowing and being so that we can continually endeavor towards the goals of a more just society. In reviewing the book, Prof. Ronald Niezen, the William Lyon MacKenzie King Visiting Chair at Harvard University, was so impressed by the work and felt like it would be a good fit for the Canada Seminar at Harvard, he invited Dr. McMillan to present a paper and speak. Previous speakers have included the Hon. Paul Okalik premier of Nunavut, Jeffrey Simpson, columnist and author, and Ken Dryden, author, MP, and former president of the Toronto Maple Leafs. Dr. McMillan was also recently in Toronto with Mr. Marshall’s family to accept the inaugural Donald Marshall Award from Innocence Canada, an organization which advocates on behalf of prisoners who have been wrongfully convicted. Donald Marshall Jr. was the first person in Canada to be exonerated, and to honour his fight, Innocence Canada created an award in his name for other wrongfully convicted people who never give up until they are vindicated. The organization presented the inaugural award to Mr. Marshall’s family and to Dr. McMillan.